← In the land of the one-eyed King……….. 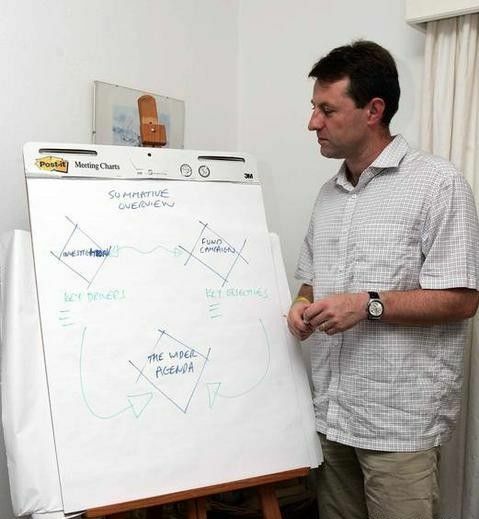 Photograph of Gerry McCann – June 16th 2007 . Facts by themselves can often feed the flame of madness, because sanity is a spirit. The parallel worlds of the McCann’s private investigation to prove that anybody, other than themselves, was culpable in the disappearance of their daughter, and the official British and Portuguese investigations, which includes suspicion of the McCann’s involvement into her disappearance, continued apace this week, regrettably with only the ‘unofficial’ parental investigation prominently reported in the British press. Raymond Hewlett was named as ‘a person of interest’ in the McCann case, a fact juxtaposed beside the information that a DNA sample had been voluntarily given by him, leading many to believe that there might be a connection between these two items. In fact the smooth skinned 65 year old Briton, described in the Sunday Mirror as ‘strikingly similar’ to the ‘pock marked 35 year old of Mediterranean appearance’ that the McCann family have heavily touted as being the ‘chief suspect’ as witnessed by one of their party, had given the DNA sample in respect of an offence committed some 30 years ago. Both the British, German and Portuguese Police appear to be remarkably unwilling to connect this convicted child abuser to the McCann case beyond the fact that he was resident in Portugal – some 100 miles away – as were several hundred other British child abusers, at the time of her disappearance. That hasn’t prevented Mr Hewletts name and face from being prominently displayed across the British press with many misleading allusions to his connection to the case – not least that he has refused to ‘give an alibi’ to the private individuals repeatedly described as ‘investigators’ or even more misleadingly as ‘detectives’ in the British press. The British press have failed to report the information issued by the Attorney-General’s office in Portugal. Then we had the curious affair of the ‘petition to the Prime Minster’ requesting that British Police investigate this Portuguese crime. Running out of its time slot to acquire the all important 500 signatures to gain the Prime Minister’s attention, the petition suddenly acquired a raft of new signatures. E-mails flew around the world as it was realised that the petition had acquired new names, my own included, of people who would never have voluntarily signed such a petition. Dark deeds were hinted at. Those names have now been removed by No 10 web administrators and investigations continue – the petition languishes below the Prime Minister’s radar. Yesterday we had the sad admission from Joanna Morais, who now has the distinction of being the sole reliable source of fact as opposed to fevered rumour and speculation – on either side – that the so-called journalist ‘Duarte Levy – was nothing of the sort, little more than a common fraud. Duarte Levy has figured largely in the reportage of the McCann affair, appearing on television and heavily quoted by the British and foreign press. I don’t propose to give this man any further oxygen of publicity by discussing the matter further – you can read the full story here. Last night, the Portuguese television station TV1, disclosed that one of the first GNR (the equivalent of the British ‘bobby’ on the street, as opposed to the PJ, which are the equivalent of the CID) on the ‘crime scene’ was under investigation after the discovery that some 120,000 euros in cash, in batches of 10,000 euros at a time, had been paid into an account in his name a short time after Madeleine ‘disappeared’. This GNR officer is important to the investigation for it was his apparent errors in allowing the family and friends to repeatedly enter and leave what should have been a secure crime scene, that made the initial forensic results null and void. He was also the witness to a ‘walk’ undertaken by Gerry McCann in the early hours after his daughter was reported missing. It should be born in mind that other GNR officers, as have other British police officers, have been convicted of corruption, see here, in matters entirely unconnected with the McCann saga. It does, however, add one more ‘fact’ to feed the everlasting flames of Maddie-ness. How persipacious of Gerry McCann to have considered the ‘wider agenda’ (see photograph) a mere two weeks after his daughter had vanished, at a time when the rest of us had assumed that this story would have a happy resolution in a relatively short space of time. Back to the constant recurring theme. Good morning, Anna. Your post addresses many issues, old and new, in this endless saga. Gail Cooper hasn’t stepped forward yet to confirm that this is the man who “made her blood run cold”, did she? Hm. Anyone in for a nice , long discussion about white vans and blue vans b.t.w.? I’d rather blue Dodge that issue, thanks. I worked tyrelessly on that one! Give me a Day [24 hours], a Dictionary [English] and a DVD [all Monty Python classics] and I’ll come up with something equally funny. Will you wheel a wheel while waiting? I was going to write “wait for my coupe de grace” but I can’t figure out how to do the french accents, so I thought since you can, Chatelaine, you should type it out with the accents and consider it yours! I do recall Gerry McCann at the Madeleine has been missing 50 days stage, and the release of 50 balloons, stating that they planned to release 100 balloons at the 100 days stage. I picked up this Freudian slip and blogged about it, asking how come Gerry McCann knew beforehand that Madeleine would not be found by the 100 days stage? Sudden backtrack from Gerry McCann as he then announced “if she is not found by then”. 2. Why did the McCanns lie about a fake break-in? 3. Why did the McCanns think it was safe to leave 3 children under 4 years of age unsupervised Home Alone? I admit they are leading questions, but if the McCanns are ever brought to book in a court of law I suspect that they would have the utmost difficulty answering them to the satisfaction of lawyers, judge and jury. The three most valuable things they had, left in an unlocked apartment? Then we shall have to hold different opinions, Honest Broker. Jo Morais is a very honest person. Levy fleeced her quite some time ago, she kept quiet until she knew that he was dishonest in other ways, so I don’t agree with your analysis that she only exposed him because he had fleeced her. I can’t help thinking that Dr McCann could have found time before June 19th to tap out his blog comments if he was really keen to balance – “the sensationalised reporting in certain sections of the media with regards to Mr Hewlett” – , instead of watching Mr Hewlett’s profile raised in the public’s awareness over the past couple of weeks. Good point Gloria – time lag is interesting. Drat. Those inverted commas have inverted themselves. Miracles take a little longer! And aren’t we all used to a certain family spokesman popping up to clarify any inaccuracies when required? Wow! Could you do anything with a bottle of water and an empty caraffe? Hm …better late than never: “distinct” should have read “distance” ? hm again… Whatever happened to Esperanto? I can’t reconcile all this chat about Gerry as though there is something we all know,nudge nudge , but yet we none of us actually know what this something is. Perhaps better if the McCanns accepted the likely death of their daughter and shut up, became recluses, and we can forget them. What are the alternatives , they sold her, they killed her deliberately, they took money for her? Which do you fancy ,or maybe they just left the door open and hoped someone would happen along? They have faced up to so much media coverage and interviews ,knowing that the police always look at the parent[s] first and frankly no sign of any guilt other than the obvious one of leaving her vulnerable. A possible alternative is that they found her dead and rushed out and buried her and claimed an intruder wot done it. All not proven and frankly not remotely likely. It just isn’t fair to expect someone to prove a negative ie i didn’t do it for these reasons. If the McCanns were complicit in this tragedy they must have graduated top of the class from RADA. poor things, my heart is almost bleeding. jail, struck off, end of career etc. ? The alternative is to shut up, go home and grieve in private. This would have served them just as well even if they had , in collusion with Elvis or M15 say, actually done something other than leave the children un protected. And all his friends know this unpleasant thing do they? Not one seems to be willing to even hint at it. Still, must be true, he has those killer’s eyes, I spotted that right off, oh yes , you can’t change the eyes, like that Austrian bloke , and her?- an obvious psychopath . Waterboard him I say, then the truth will come out. ivan on Nature or Nurture? binao on Oh Glorious Day! Cascadian on Oh Glorious Day! Twig on Oh Glorious Day! The Box Brownie and the Dead Tree Press. Delud-Ed on ‘Rip Off Britain’.